The presumed aetiology of mental retardation is also the presumed aetiology of epilepsy in most patients. (2223) In addition, patients with mental retardation may develop an ischaemic or haemorrhagic lesion, a neoplasm, or another lesion in the brain which may lead to epilepsy. (22> The presumed aetiology of epilepsy can be found in about three-quarters of the patients. 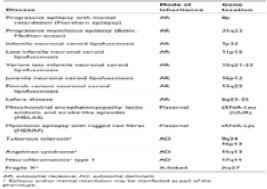 In the aetiological classification based on the time of the presumed cause of epilepsy and mental retardation, prenatal aetiology is the most common (Table..7). In the aetiological classification based on presumed cause, the categories of unknown prenatal influence, infections and intoxications, trauma and physical agents, and other specified aetiological agents cover most of the cases ( T.ab!e 8.). In patients with mental retardation and epilepsy it is important to try to find the cause of the intellectual impairment, epilepsy, or epilepsy syndrome. In some cases, the epilepsy syndrome or an underlying inborn error of metabolism may be relevant. Basic mechanisms leading to epilepsy include disturbances in the balance between excitatory and inhibitory neurotransmitter function within brain cells and their connections to important channels such as voltage-gated sodium channels. For instance, hyperactivity of the excitatory neurotransmitter glutamic acid and/or hypoactivity of inhibitory neurotransmitter g-aminobutyric acid ( GABA) may lead to epileptic seizures. 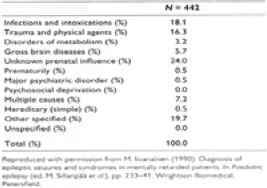 The existence of so many genetically determined disorders leading to mental retardation and epilepsy (28> (Iabje.9) and the large variation in the prevalence of epilepsy in the specific mental retardation syndromes suggest that genetic factors play an important role in producing epilepsy. The three following examples, as well as those mentioned above, illustrate this variety of genetic explanations for epilepsy among mental retardation syndromes. (25,) Angelman syndrome is a contiguous gene defect most often caused by a maternally inherited deletion of chromosome 15q11-13. Several of the deleted genes code for GABA receptor subunits. Deficits of inhibitory GABAergic function could directly predispose affected individuals to seizures. This hypothesis is supported by knock-outs of analogous chromosome region in mice, which produces an epileptic phenotype. In the tandem trinucleotide repeat disorder, fragile X syndrome, triplet expansion (CGG) results in shutdown of fragile X mental retardation 1 gene transcription, which may alter overall neurologic development and lead to seizures. Thus, there exists a spectrum of epilepsy mechanisms among these three mental retardation syndromes, ranging from deletion of a gene or genes that directly leads to hyperexcitability (Angelman syndrome), to a chromosomal triplication that alters several aspects of neuronal development and function (Down syndrome), to a specific tandem repeat which alters neuronal function in a non-specific and probably benign manner (fragile X syndrome). It remains to be seen how much dissection of genetic mechanisms underlying other mental retardation syndromes will provide additional insight into epilepsy mechanisms.